For gardeners who want to give their garden the best care in the least amount of time, landscape fabric combined with a soaker hose saves resources and time. Landscape fabric forms a barrier over the soil that prevents light from reaching weed seeds that may be growing under the soil. The fabric keeps the weed seeds from germinating and blocks new weed seeds from reaching the soil. 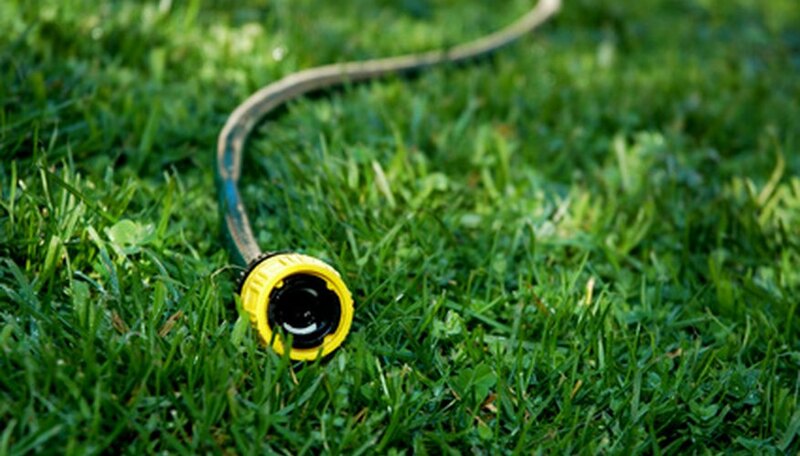 A soaker hose on a timer provides just the right amount of water to plant roots and prevents evaporation. Use a soaker hose with landscape fabric to improve your garden. Rake over your garden bed to remove large rocks, sticks or debris that may perforate your landscape fabric. Connect a back-flow preventer valve to an exterior faucet using the male and female screw ends. Screw a hose timer onto the back-flow preventer. Join a short garden hose at the hose connector to the pressure regulator. Unwind a soaker hose throughout your bed around the roots of plants. The hose must be near the plant roots to correctly deliver water. Arrange the hose over level ground for even water distribution. Never use more than 100 feet of hose. Using more hose than this will cause it to lose its effectiveness. Connect the end of the soaker hose to the end of the short garden hose. Turn your faucet on just enough so that the entire soaker hose is seeping, but not spraying. Adjust the timer so that it automatically turns on and off according to your bed’s watering needs. Some perennial beds should be watered up to 30 minutes with a soaker hose twice weekly. Annual beds or vegetable gardens may need daily watering. Cut your landscaping cloth to fit the correct size of the bed. Lay the cloth over the soaker hose on the surface of the bed. Anchor your landscaping cloth in place with landscaping fabric anchors. Cover your landscaping cloth with a 2- to 3-inch layer of mulch.